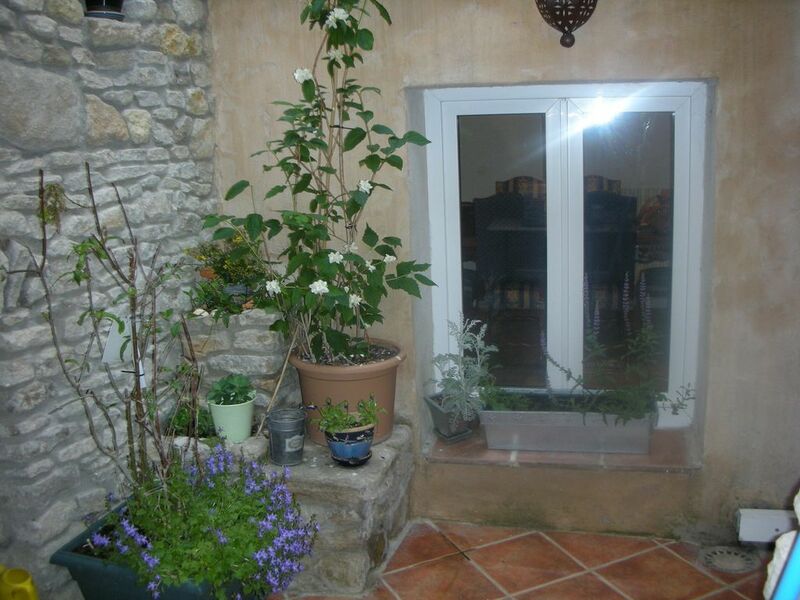 A perfectly located house in the heart of L'Isle on Sorgue (in a small cul de sac street without cars). You will like its Provençal charm and nice decoration. The house is fully furnished and equipped like a cosy home. Linen, towels and wifi included. On the ground floor a dining dining room with HD screen, an equipped kitchen, toilets and a flowery provencal patio. A dependency is available to store bikes. Washing machine and dryer included. On the first floor one living room bedroom equipped with HD screen, one couch for trop people (2 × 80 x 200) and o e single bed. On the second floor one bedroom (double bed), a very nice shower room with toilets and a dressing. L'Isle en Venaissin: The town of L’Isle-sur-la-Sorgue used to be called “L’Isle en Venaissin” was originally a city of fishermen on land salvaged from the river. Called “Insula” in the Middle Ages, the city was a true island amidst marshlands which were slowly drained by the construction of the canals. Many canals were dug, both through and around the town, giving rise to the affectionate name of « Venice of the Comtat ». Waterwheels: Since time immemorial, the steady, abundant waters of the Sorgue river have powered crafts and industry. Sturdy waterwheels led to the establishment of flour mills as early as the 12th century, then to the creation of workshops which worked with wool and silk. The picturesque water wheels which today remain, imparting a special charm to Isle-sur-la-Sorgue, only barely represent the seventy-two wheels which churned away in the 19th century, and the intense business activity which thrived in the city centre. Silk works gave rise to immense fortunes, and Isle-sur-la-Sorgue was also the wool centre for the entire department of Vaucluse. Historical center: The historical city centre was once surrounded by ramparts, and continues to exude the charm created by the marks left by each passing era. The “Tour d’Argent”, which stands near the apse of the church, was built in the 13th century by the Counts of Toulouse. Not far from there, sumptuous city mansions with Gothic or Renaissance façades line the narrow city streets, bearing witness to the fact that Isle-sur-la-Sorgue was once the chief city in the Comtat. Notre-Dame-des-Anges collegiate church, rebuilt (except for the chancel) in the mid-17th century, is an outstanding example of Baroque art in southern France. The Brun family of architects has left several remarkable constructions, including the Granary, now home to the Tourism Office and the hospital with its lovely vestibule, chapel, apothecary and beautiful garden and fountain. The Brun family also built many city mansions, including the gracious Hôtel Donadeï de Campredon, now home to the Maison René-Char. This provencal house is unique. In the heart of the old town the place is quiet and its patio is beautiful and fresh. Provencal bathroom : large shower, sink and toilets on the 2nd floor, next to the second bedroom. Patio. Table and 4 chairs. Fumeurs dans le patio extérieur. The beds all have good quality mattresses, and rooms are beautifully decorated Wheelchair inaccessible, long term renters welcome, children welcome. Tucked away off a bustling thoroughfare in this wonderful town of L'Isle sur la Sorgue, this 3 level home was very comfortable for just the two of us. We enjoyed our stay in this "old France" style home, though you did need to watch your head going up the stairs! Everything was clean, well equipped, and as listed in the description. Valerie was a joy to work with. The process for reserving the property could be improved if credit cards were an option; the wiring process was certainly doable, just a bit less convenient. All in all, great experience. We would recommend this property to friends or family if ever traveling to the area. Thank you for your comment. Credit card payments are just now possible on HomeAway website. See you maybe another time in L'Isle sur la Sorgue. Best regards. Valerie METOÏS. The house was exactly as described on the website - right in the heart of the old town. Valerie the owner was extremely helpful and friendly. The house was immaculately presented & clean; had free wi-fi, a nice outdoor terrace, and plenty of room on each of the floors. Close proximity to the old town's cafes, bars, restaurants, waterwheels and secure parking nearby. Thanks for a great holiday Valerie. My husband, one year old daughter and I were sad to leave behind the authentic charm of this quaint little village, made all the more welcoming by the warmth and accommodating hospitality of Valerie and her gorgeous, ideally located house. I laughed when I read the comment by the American about the 'unsafe alley' and 'mean looking dog'! Nothing could be farther than the truth! I felt very safe and was happy to stroll my baby's pram out late and that dog is actually very friendly and my daughter would pat it when we would come home from our evening walk. As a matter if fact that dog keeps a watch on the street! There was fresh orange juice, and lovely home made jams int the fridge and the kitchen was well stocked with utensils. I would love to come back!! What a nice place. We loved to walk in the town, discovering markets, restaurants and shops, and all the villages in Luberon like Gordes, Ménerbes and Lacoste. Thank you Miss METOÏS. We hope to come back ! See you ! Valerie METOÏS. The property is advertised as "down a quiet cul de sac street" It is actually located down a filthy alley lined with trash bins and loose trash and a mean looking chained dog which is behind several restaurants. The smell and noise from the restaurants is bad. The only windows ventilating the property open to the alley allowing the smells and noise of the restaurants the permeate the property. My wife and I felt that this was not a safe and secure environment where we wished to spend a week of our vacation. We would have been scared to death to come and go after dark. We would have had to park more than a 1/4 mile from the property to unload our luggage. We rejected the property and forfeited our deposit as well as paying an additional 150 euros to stop the owner from screaming at us. To be kind, I proposed to reduce the balance by half, even if the French law obliges to pay the total amount. L’Isle sur la Sorgue is a small town typic of Provence, worldwide well-knowned and appreciated for it’s unique charm: small streets, old houses, markets and antiques. Under no circumstances it can be described as a “filthy”, noisy and unsecure place, full of mean dogs. There is no chance to be “scared to death” !!! The house has the advantage to be located in the center of the town but in a cul de sac street with no traffic. It has 6 windows facing both the alley and the patio. No one has ever complained, on the contrary if I consider all the positive comments left in the house’s guest book and the number of people who came back. Perfectly placed for easy day trips to Gordes, Roussillon, Menerbes, Fontaine de Vaucluse, Avignon, Orange, Arles, the Camargue, the wine of Chateauneuf du Pape, Mont. Ventoux. Golf Provence Country Club is located on the lower slopes of the Vaucluse with views across the plains to the Luberon and Alpilles mountains. It is on the outskirts of the beautiful hilltop village of Saumane, home to the De Sade family whose Chateau dominates the area. The Golf Provence Country Club logo is derived from their heraldic crest. Picturesque L'Isle on Sorgue is 3km away, a town of canals, waterwheels, antique shops and restaurants. Numerous other wonderful places are within easy reach.